The original high-powered, all-tube bass behemoth, exclusively for UAD-2 and Apollo. Developed by Brainworx, the Ampeg SVT-VR Bass Amplifier plug-in offers an exacting emulation of the classic 300-watt all-tube behemoth and its equally legendary 8x10 cabinet — exclusively for UAD-2 hardware and Apollo interfaces. The legendary SVT bass amp is the result of Ampeg’s desire to create the, “biggest, nastiest bass amplifier the world has ever seen.” Mission accomplished. The SVT has righteously stood the test of time, regardless of genre, with unmatched power and tone. Introduced in 1969, the Ampeg SVT (Super Valve Technology) has remained the reigning king of high-powered tube bass tone. Featuring six 6550 power tubes and a monstrous, back-breaking speaker cabinet, the SVT quickly found favor with players who needed to fill arenas with thunderous low end, punishing mids, and musical high end. From Bootsy Collins to Tony Levin, Chris Squire to Robert Trujillo, hundreds, if not thousands of bassists have called on the SVT to deliver huge, unmistakably rugged bass tones. The Ampeg SVT-VR Bass Amplifier plug-in provides all of the raw power and punch of the hardware, putting a raging beast directly into your DAW. Whether you’re tracking through the SVT with an Apollo interface, or reamping an existing bass track with any UAD-2 hardware, the SVT-VR plug-in offers myriad tones for any genre. The Ampeg SVT-VR plug-in features tools that greatly add to its versatility when tracking bass guitar. The FX Rack features an onboard noise gate, Power Soak, and pre/post switchable EQ filter controls, allowing you to put the finishing touches — before or after mixdown — on your tones. But it’s the SVT-VR plug-in’s 23 Recording Chain presets that give you the ultimate in flexibility. Captured through Brainworx’s ultra-rare Neve VXS72 console, these presets let you audition your sounds through a variety of vintage mics, cabinets, and outboard gear. It’s akin to an engineer patching you through various chains and mic placements. Harnessing UA’s groundbreaking Unison technology, the Ampeg SVT-VR Bass Amplifier plug-in gives you the impedance, gain staging, and circuit behaviors that have contributed to making this iconic tone machine one of the most recorded bass amps in history. 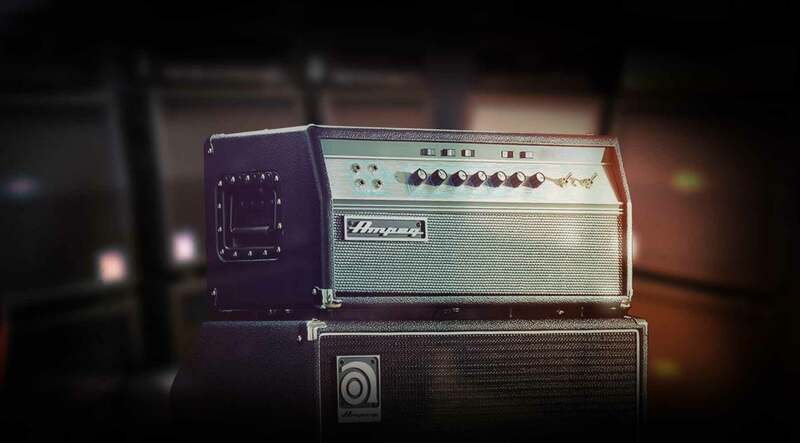 It´s the Ampeg SVT-VR, Just like that! I am a studio bassist and have been recording as an engineer since 2008. I own a Trace AH250 which I'd use once in a while for tracking. I have never been a fan of Ampeg at all, they actually sound completely inferior, especially the clumsy 8x10 stack which is horrendous and doesn't come close to modern boutique cabs like Shroeder etc. But when I used it to lay down some proper backing tracks for a modern funk tune this thing exploded! It just blew my mind, and i used a standard preset with minimal tweaking. This is a total no-brainer ! This plugin is everything I have ever wanted in a bass plugin - plus the bonus of no CPU drain. The sounds is killer, I add this and a 1176 and get huge, fat, tight bass sound. And, I don't have to mic anything, drag my head and cab around. I couldn't be happier, best in class, look absolutely no further. Getting a good bass tone is one of more challenging tasks in mixing for me. A good amp emulator is often the solution when dialing in changes to what you've got already, be it a combo of DI and amp. I've used everything out there I could find. Now that I'm on UAD-2 I am using Ampeg SVT-VR for reamping bass, and it's everything and a bit more, due to the mic modeling. The automatic switching through the various mic/cab options saves you from doing it yourself, which gets you a little more away from expectation bias. So far I find the tones very heavy and give more than enough heft in the mids and lows- what you're usually trying to get with an amp signal. A combination of this and the UAD dbx 160 compressor brings classic tones. Long time user of Ashdown bass amps with nice valve stages. This has replaced it for my recording purposes. Great tone and weight, sits well in the mix. Can't wait for them to model the Portaflex! I have an Ampeg PF-500 head with 6X8 Ampeg cab, and the IK Multimedia SVX plugin. This UAD version is different than either of those, and that's a good thing for choices. So to sum up - nice plugin, totally worth the price of admission. Great on songs where you need more note definition. I'm using it more and more. Slap a UAD Fairchild 670 compressor on it for a great solid sound. After years of trying to get good sound out of DI bass tracks I finally came up with a pretty cool plug-in chain that I've been using as a starting point. Yesterday I activated the SVT-VR demo and did some A/B tests: my plug-in chain vs. the SVT-VR. No contest - this thing just completely rules. I've had trouble mixing 5 string bass parts (and w/ drop D tuners) for as long as I been tracking them. My old workaround (a combination EQ and Multi-band compression) would tame the bottom but leave it unfocused.Then I started this SVT demo 2 days ago. Instant perfect bass sound, no real tweaking necessary. Most of the presets offer different takes on the same theme: big, tight, punchy tone. I can clearly hear every note in the low register of a 5 stringer now. The power soak feature allows you to really push those tubes for added aggression if needed. Listening to a couple mixes on a variety of sound systems confirms what I heard at the studio - perfect, awesome Ampeg character. In under 30 seconds. I record bass for 15 years now,and I tried every plugins and pedals that emulate a bass amp sound. By far, this plugin is the most realistic one. I played a lot on SVTVR, and I love this amp. This emulation is so close. Thick sound that does not choose a genre. Especially the best match for jazz bass! I would never be able to dial in these tones in the room I have to work with. I can slot bass tracks to sit right where they need to be, and tweak on the fly. No need to carry an Ampeg down the stairs. Thanks. Looking forward to the Gallien-Krueger plug. Really great sounding plugin. Sounds just like a real Ampeg SVT-VR. A beautiful analog sound that can go from warm and fat to knarly and overdriven. Very versatile. The SVT has a good sound for bass, but since I'm not using distortion like with guitar, I look at this plugin like any other preamp. I plug a P-Bass into the Hi-Z input with an SVT or a Neve or 610 preamp and like all the results depending on the song I'm working on. I will say I'm addicted to the Fairchild for bass compression and sometimes double compress lightly with a Distressor. My sound is heavy rock with a seventies influence. Bass isn't just mud anymore! This is incredible!!!!! Sounds exactly like a SVT and I should know I had our bassist point one at me for 4 years. I was thinking of getting a bass emulation but was always worried I'd get nothing but mud and buzzzzzzzz, Glad to say UAD found a way to cram a whole lot of love into a bass program. Loving this and I just tapped the surface of what it can do!!!!! Try the demo, now I'm gunning for the 15 watt other Ampeg!!! Still way better than any bass sims that I own. I am always in awe of what UA is capable of. This amp can bring life to a DI bass or supplement an existing one. I like running synths through it to add a bit of a re amp vibe. Wonderful tool. I have it pulled up against the hardware amp currently and I am impressed. WOW!!!! What else is necessary to say. All the hype is true, I hate DI bass, lets get that said now. I'd do anything,... to get a real amp tone, ( and yes I've done it all, even putting the bass amp in my living room upstairs). But this single plug has changed the world for me. Folks just use the demo for 30 days and see for yourself. It's so easy and fun to finally have a plug of this quality that you can rely on a Plug as if it were a real AMP!!!!!! Please try it and if I'm lying I'm dyeing!!!!! I've tried others but this is in a class of its own.